Ninna je simpatičan apartman smješten u malom mjestu Drobežija u centralnoj Istri između Buzeta i Motovuna. Okružen je netaknutom prirodom sa prekrasnim pogledom na Istarsko jezero Butoniga. Na samo 9,5 km udaljenosti nalaze se Istarske toplice koje međuostalim u ponudi imaju i wellness. Apartman Ninna nalazi se u kući u nizu koja je izgrađena davne 1890., a potpuno je renoviran 2017. godine. U selu se nalazi svega nekoliko kuća od kojih su samo 3 naseljene ili se iznajmljuju. Gostima na raspolaganju stoji dvorište sa djelomično natkrivenom terasom sa stolom za objedovanje i roštiljem, te 2 parkirna mjesta. Apartman za 4 osobe ukupne površine 54 m² smješten je u visokom prizemlju gdje se nalazi dnevni boravak sa stolom za objedovanje, opremljena kuhinja, dvokrevetna spavaća soba, manja ostava, tuš/WC kojem se pristupa sa verande na samom ulazu u apartman. U potkrovlju kuće nalazi se još jedna klimatizirana spavaća soba sa bračnim krevetom. A wonderful, delightful place. Close to many attractions also by the sea. You can relax from the crowds. Every day you can admire views from a fairy tale. Very clean. The owners are very nice. I've never met such nice people like them. They gave us unique souvenirs. We want to come back to this place. It was the best place we ever rested. Vielen lieben Dank für alles, ich denke wir sehen uns bald. Herzliche Grüße Kerstin. Dobar dan! Prachtig huisje met alles erop en eraan. Wie op zoek is naar rust, is hier aan het juiste adres. Eigenaars zijn zeer gastvrij. Een aanrader! Het huisje is gelegen te midden van prachtige natuur. Door de centrale ligging kan je ook echt overal heen voor uitstappen. Wer die Abgeschiedenheit liebt ist hier genau richtig, die Anfahrt zur Unterkunft ist ein kleines Abenteuer! Das Häuschen ist komplett ausgestattet mit allem was das Herz begehrt und dies zu einem unschlagbaren Preis!! Die Eigentümer unheimlich nett und total lieb. Sehr zu empfehlen!!! Geweldig mooi schoon huisje hoog in de bergen, voorzien van alle gemakken, volop rust en een prachtig uitzicht. Simply one of the best experiences we’ve had. The hosts were responsive, thoughtful and extremely hospitable. The location is remote and rural yet the apartment is fully equipped with modern amenities for an exceptionally comfortable stay. A well situated home base to explore the Istria region including Motovun and Rovinj. We woke to bird song each morning, sipping coffees on the patio. Around the corner is a gorgeous view of the lake (Jezero Butoniga). 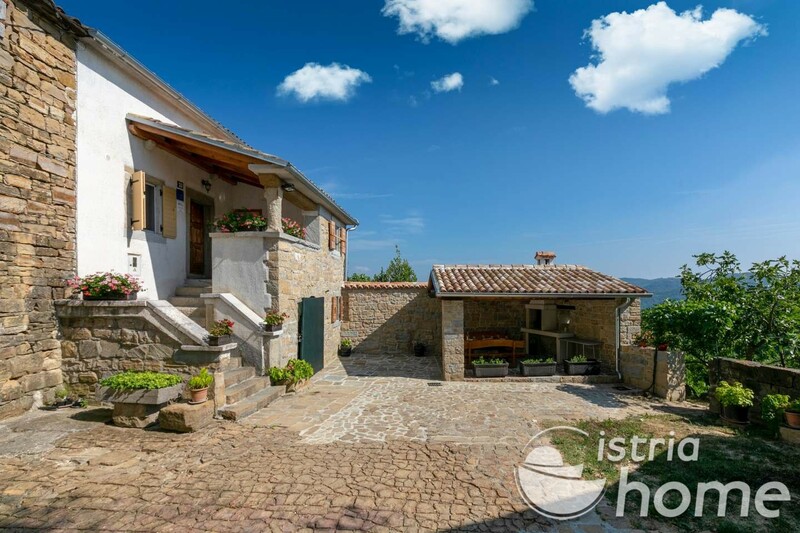 If you enjoy a true getaway and authentic Istria we highly recommend Apartment Ninna. What a wonderful stay! Jasmin's place near Sovinjak is excellent. It feels extremely remote and as private as you get, but is a short drive to lots of fun stuff and some great restaurants, assuming you can drag yourself away. Walking nearby is gorgeous, and all of the views are absolutely stunning. The house is extremely clean and recently renovated, and the kitchen is well stocked with cookware. The beds are quite comfortable, and there is a whole extra small room for yoga, drying laundry, or just keeping your things. Also this is one of the only places in Croatia where we found screens in the windows, so you can have a breeze come through without worrying about insects. It is just slightly unfortunate to have to go through the terrace to get to the bathroom, but it is only a couple of steps and really no big deal. If you're in the bedroom on the top floor then getting to the bathroom also involves a staircase, so that's something to be aware of. But really everything else about the place is so fantastic that this is a very minor detail. Bojan (the owner) left us some home-made wine, olive oil, and cheesecake, which were very thoughtful touches. Bojan also responded quickly to questions. We really enjoyed our stay, and will definitely go back if we come back to the area (which we hope to). The house is spacious, beautifully furnished and clean. The beds are comfortable. The kitchen is very well equipped and we had everything we needed for both light and elaborate cooking. Great Wi-Fi. The house is located in a very picturesque and tranquil place with a wonderful view from the terrace. It is a good starting point to travel Istria. We made a day trip to Pula, Rovinj and Porec. Trieste is not far away and it is also a good destination for a day trip. There are a lot of small picturesque towns nearby, some of them are famous for their truffle products. The host and his wife were really welcoming and friendly! They welcomed us with a cheesecake and some olive oil and honey, which they make themselves. The oil is made from the olives that grew on the trees on the hill next to the house. So you are getting some local taste. We ended up buying some oil and honey to bring home and were really happy about this. Thank you! We had a great time! Petite maison en pierre du pays, perdue dans la montagne au milieu d’une nature superbe, avec une vue magnifique. Nouvellement rénovée et parfaitement équipée. Tout à fait conforme aux photos. Pour 2 personnes, la taille de la maison est tout à fait suffisante. Les réservations sont apparemment centralisées par une agence, mais nous avons été accueillis par le jeune couple de propriétaires. Accueil parfait avec un délicieux cheese-cake fait maison, du vin rouge, du miel et de l’huile de leur production. Les propriétaires sont charmants ; nous avons même eu droit à un petit cadeau de départ. Nous avons particulièrement apprécié la vue de la terrasse sur la vallée (magnifique par beau temps comme par temps orageux), la tranquillité et l’absence de voisins (il y a 2 maisons autour, mais elles étaient inoccupées), la propreté et l'équipement complet de la maison. Nous avons adoré notre séjour d’une semaine. Une voiture nous a semblé indispensable. Really wonderful and quiet place. The apartment is a whole house with two bedrooms, a bathroom, kitchen, a second room, etc. Although you have to drive a couple of kilometers until you arrive in the old village, the apartments is fully equipped. (Wifi, dishwasher, washing machine, air conditioning) We've been almost alone, there is only one further apartment in the tiny village, but during our stay it was not rented. Bojan and his wife are perfect hosts. They really take care of their apartment. The apartment is really clean and renovated. The apartment is near Sovinjak. By car it takes you round about 30 minutes until you are on the coast (Novigrad). We also visited Buje and Momjan by car from Dobrezija. Because the perfect view we stayed in the apartment for the whole day and walked through Dobrezija. If you are looking for a quiet place and really friendly hosts, this apartment is highly to recommend! Een prachtig huisje met een geweldig mooie omgeving in een wat minder toeristisch gedeelte van Istrië. De eigenaren doen er alles aan om je het naar de zin te maken. Je hebt in het appartement geen naaste buren en het appartement is van alle gemakken voorzien. Douche en toilet bevinden zich buiten het appartement, maar dit is absoluut geen probleem. Vanuit het appartement kan je makkelijk dagtochtjes maken. Veel toeristische plaatsen liggen op nog geen half uur rijden afstand. In de omgeving zijn meerdere middeleeuwse plaatsjes en en bronnen bad waar je heerlijk kunt zwemmen en ook de zee bij Novigrad is binnen een half uur te bereiken. Een dagtocht naar Rovinj is ook een aanrader. Absolutly beautiful place in peaceful, rural part of Istria. Old, over 200 years old house, fully renovated, surrounded by olive trees! Views are stunning, and drive through mountains from Buzet or Motovun is breathtaking! Perfect place for relax away from crowds but still close enough to the coast - about 30 minutes ride. Perfect summer destination!! And the hosts - Bojan and his wife are really nice and friendly people! We'd love to come back and stay much longer! Hvala!